$10000 PRICE REDUCTION!!! Spectacular Waterfront Home on a Canal that leads to an 80+ acre ski sized Lake! 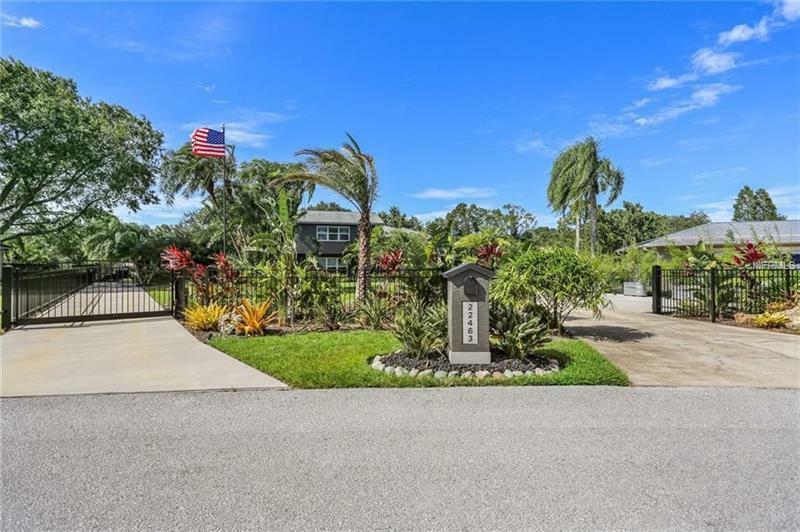 Your own private oasis awaits you behind the two solar powered gates with separate driveways and beautiful landscaping palm trees bamboo and a Koi pond. Situated on almost 3/4 fully fenced acres this home features 3 bedrooms 3.5 bathrooms PLUS a bonus room storage room and a detached 30' x 50' garage w/ 12' doors 16' ceilings storage loft workbench and double doors to drive through to your private boat ramp. The amazing backyard is huge and perfect for entertaining guests featuring a large granite patio with a fire pit dock tiki bar pallet house and a zipline with all equipment included. The spacious 2 story house features an open floor plan newly painted interior vaulted ceilings beautiful hardwood and tile flooring stainless steel appliances washer and dryer and water softener system. The community Features access to 3 private ski lakes a private horse stable a fishing lake playground parks with picnic area and boat ramps. Voluntary HOA fee and a non-deed restricted community! This home is perfect! Amenities Additional Fees: Buyer to confirm HOA info. Pet Restrictions: Buyer to confirm pet restrictions.